Visual Similarity Duplicate Image Finder is a tool that can identify similar photos by “looking” at the image content. 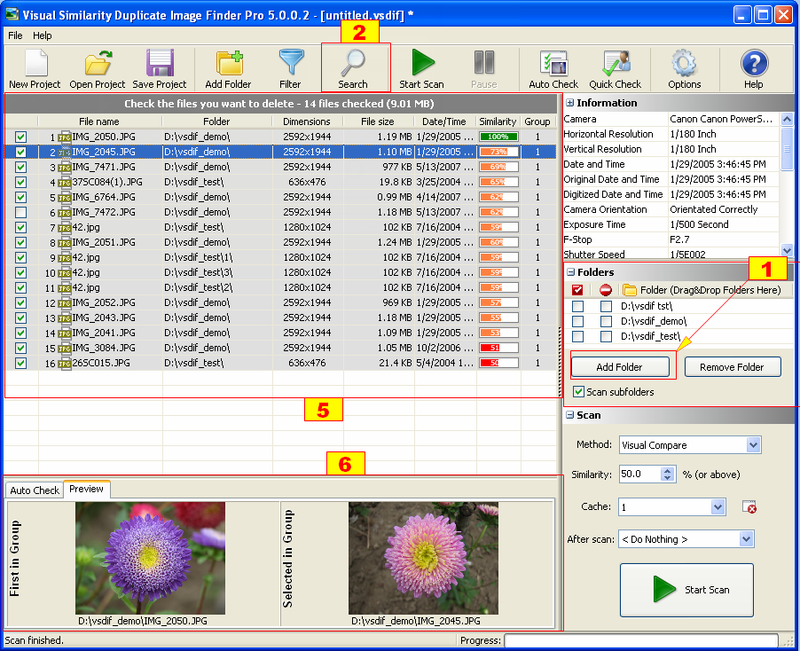 Unlike the standard duplicate file finders that look at the file data, this duplicate photo finder compares the actual image content and can identify similar images even if they are stored in different file formats. There is a free demo of this duplicate photo finder that you can download and test. Setup the scan method to “Visual Compare”. Select an existing cache or choose “New Cache” to be prompted for a file name once the scan starts. The cache system dramatically reduces scan time for consequential scans so do not ignore this feature. Add one or more images that will be searched for. (3) There are also options to clear the list or remove the selected images. Depending on the quantity of the images, their size, the speed of the storage and the performance of the computer this can take some time. Once the search is complete all the similar images will be listed in the main window with their percentage of similarity to the ones in the samples list. 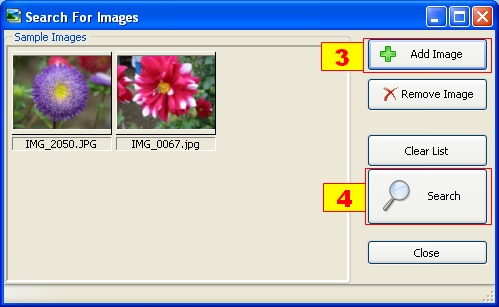 The images in the list can be located via the context menu, moved or deleted. Make sure to check the free Folder Size tool which can analyze and display disk usage information and help cleanup disks in minutes. This entry was posted in Information, Visual Similarity Duplicate Image Finder and tagged Advanced search images, Duplicate photo finder download, Facebook image search, Facebook photo search, Find photo like, Find similar images algorithm, Find similar images freeware, Find similar images google search, Find similar images image search engine, Find similar images iphone, Find similar images mac, Find similar images on computer, Find similar images on hard drive, Find similar looking duplicate photos, Find similar photos download, Find similar photos in iPhoto, Find similar photos mac, Find similar photos upload, Find similar photos using picasa, Google photo search, Image match search, Image Recognition Search, Image search catfish, Image search engines, Image search engines list, Image search iPhone, Image search mobile, Online photo search, People photo search, Photo gallery search, Photo job search, Photo search app, Photo search catfish, Search engines, Search gif images, Search images by size, Search images catfish, Search images like catfish, Search images on iphone, Search imageshack on January 9, 2014 by MindGems Support.